ApiTrace 2.0 is out. 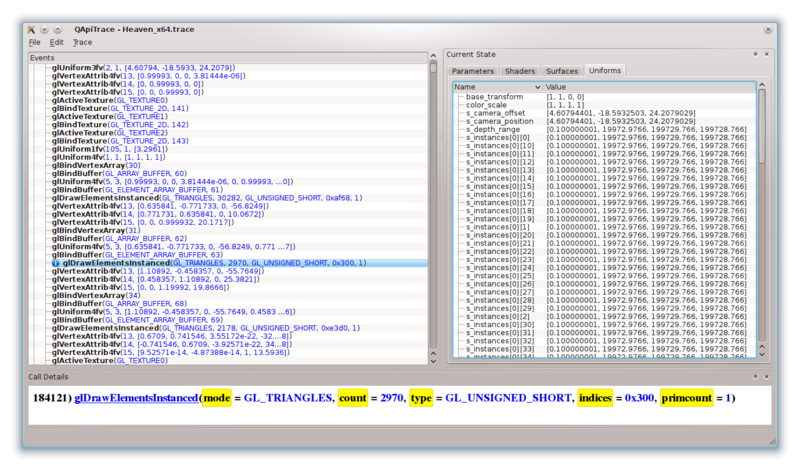 ApiTrace is by far the best graphics debugging tool out there. We have implemented so many new features since 1.0 that we have decided to bump the version number to 2.0. 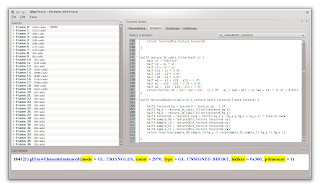 Support for `GL_GREMEDY_string_marker` and `GL_GREMEDY_frame_terminator` extensions, so you can mark frames and important pieces of code in your applications. The huge improvements in the performance of tracing came from both flushing/syncing the trace files only if there's an uncaught signal/exception and switching to Snappy compression from zlib. We also did some magic to seek and load on demand from a compressed file on the disk which means that we don't load all of the data at once. That allows us to load huge files in the GUI while using very little memory. For example loading a 1GB file takes only ~20MB of RAM. All of those improvements mean that it's possible to trace and debug huge applications with little to no costs. It's quite amazing. In fact working with graphics and not using ApiTrace starting now is going to be classified as abuse. Read the instructions and start living the life of a computer graphics superstar, which differs from the life of an average computer graphics hacker by about 10 keyboard headbutts and half a bucket of tears a week! And that's a change we can all believe in! A while ago NVIDIA released drivers with their NV_path_rendering extension. GL_NV_path_rendering is a relatively new OpenGL extension which allows rendering of stroked and filled paths on the GPU. I've heard about it before but lately I've been too busy with other stuff to look at, well, anything. I've decided to spend a few seconds looking at the videos NVIDIA posted on their site. 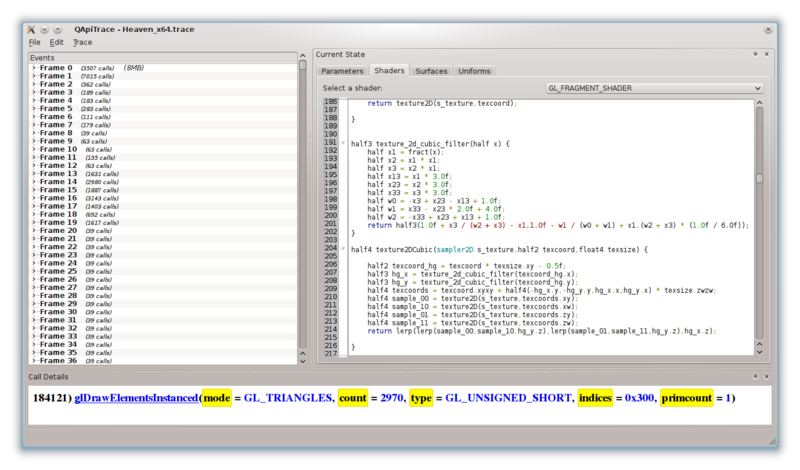 They were comparing the NV_path_rendering, Skia, Cairo and Qt. Pretty neat. Some of the demos were using huge paths, clipped by another weird path and using perspective transforms. Qt was very slow. It was time for me to abandon my dream of teaching my imaginary hamster how to drive a stick shift and once again look at path rendering. You see, I wrote the path rendering code so many times that one of my favorite pastimes was creating ridicules paths that no one would ever think about rendering and seeing how fast I could render them. Qt's OpenGL code was always unbelievably good at rendering paths no one would ever render. Clearly these people were trying to outcrazy me. Fortunately there's an SDK posted on the NVIDIA site and it's really well done. 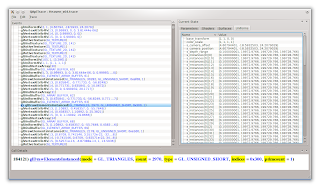 It even compiles and works on GNU/Linux. Probably the best demo code for a new extension that I've ever seen. The extension itself is very well done as well. It's very robust, ultimately though it's the implementation that I care about. I have just one workstation with an NVIDIA card in it, a measly Quadro 600, running on a dual processor xeon e5405, but it was enough to play with it. (numbers lower for both on account of them running at the same time of course). As you can see Qt is almost 4x faster. 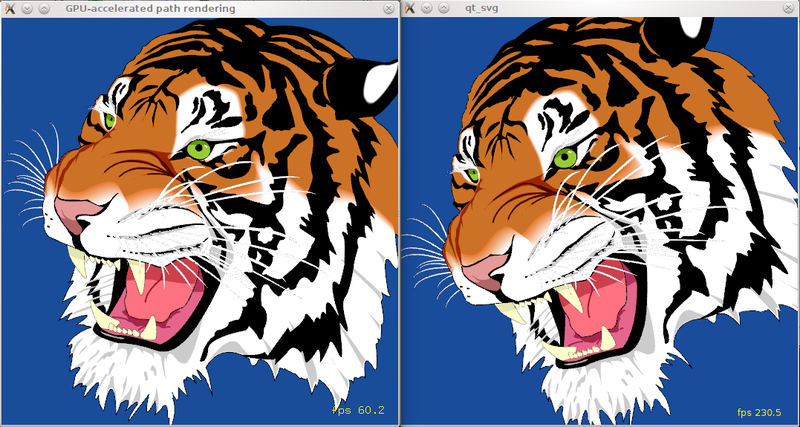 I've figured it might be related to the different SVG implementations and rendering techniques used, so I quickly hacked the demo NVIDIA posted to open a brand new window (you need to click on it to start rendering) and render to QGLPixelBuffer but using the same SVG and rendering code as their NV_path_rendering demo code. The results were basically the same. The patch is larger than it should be because it also changed the file encoding on the saved files from DOS to Unix but you shouldn't have any issues applying it. So from a quick glance it doesn't seem like there are any performance benefits to using NV_path_rendering, in fact Qt would likely be quite a bit slower with it. Having said that NVIDIA's implementation looks very robust and a lot more numerically stable. I've spent a little bit of time looking at the individual pixels and came away very impressed. In general the extension is in a little bit of a weird situation. 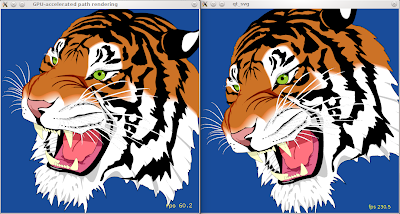 On one hand, unlike OpenVG which creates a whole new API, it's the proper way of introducing GPU path rendering, on the other hand pretty much every vector graphics toolkit out there already implements GPU based path rendering. Obviously the implementations differ and some might profit from the extension but for Qt the question is whether that quality matters more than the performance. Specifically whether the quality improves enough to justify the performance hit. I think the extension's success will largely depend on whether it's promoted to, at least an EXT or, ideally an ARB, meaning all the drivers support it. Using it would make the implementations of path rendering in toolkits/vector graphics libs a lot simpler and give driver developer a central place to optimize a pretty crucial part of the modern graphics stack. Unfortunately if you still need to maintain the non NV_path_rendering paths then it doesn't make a whole lot of sense. Mesa3D implementation would be trivial simply because I've already implemented path rendering for OpenVG using the Gallium3D interface, so it'd be a matter of moving that code but I'm just not sure if anyone will be actually using this extension. All in all, it's a very well done extension but it might be a little too late.